The Steel Will Modus is a compact utility folder that's perfect for urban carry. 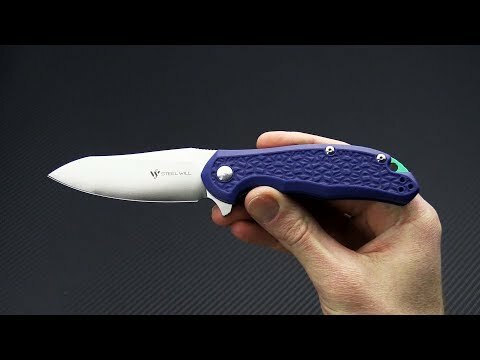 The modified Wharncliffe/Sheepsfoot blade is all belly for excellent slicing and the thin stock and high height of the grind make it even better. Made from time tested D2 tool steel and lightweight yet durable Blue FRN this 3.5 oz flipper is sure to be a favorite in your rotation. The Green Aluminum back spacer adds a subtle pop of color. Blade: A 3mm thick, satin finished D2 tool steel blade has a subtle, continuous curve along the edge for optimal slicing performance. The nearly full flat grind tapers to a fine yet robust point that delivers piercing performance with looking aggressive, perfect for use in urban environments. It opens smoothly with an integral flipper tab riding on a bronze washers pivot system. A well dialed detent makes the blade deploy just like a bearing pivot flipper but with the more bomb-proof washer construction. Handle: Lightweight fiberglass reinforced nylon is textured for grip but smooth and contoured around the edges for comfort during use. The classic blue FRN captures a jewel green anodized aluminum backspacer that has jimping along the spine in increase traction in the hand. Nested steel liners are skeletonized for further weight reduction and form a liner lock mechanism that offers smooth operation and secure lock-up of the knife. Carries via a reversible stainless steel, tip-up only pocket clip. D2 Tool Steel: D2 is a cold work tool steel that has been used as a die cutting steel since WW II. D2 has a high chromium content for a tool steel (10-13%) which gives it greater corrosion resistance than most high carbon steels making it semi-stainless. D2 offers a good combination of toughness, corrosion resistance and wear resistance for a good all around knife steel.